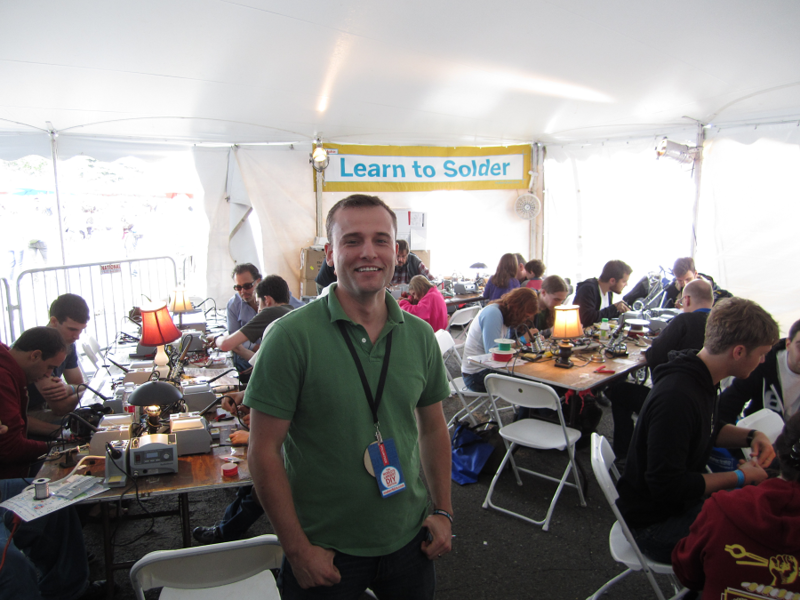 My first Maker Faire… where do I start? I could go on and on about the standard stuff: amazing projects, amazing people, etc, but here’s 3 things that I think capture the essence of my experience. I walk into the paella line on friday to hear Jimmie Rodgers say “…and there he is!” He’s talking with the Lower East Kitchen people, who use the PID library in their sous-vide kit. We wind up having a conversation over dinner that somehow winds up at plasma physics. I get to see the dual extruder thingomatic for the first time. The next morning on the train to the Faire I design a two color version of the pocket coin-op bottle opener. 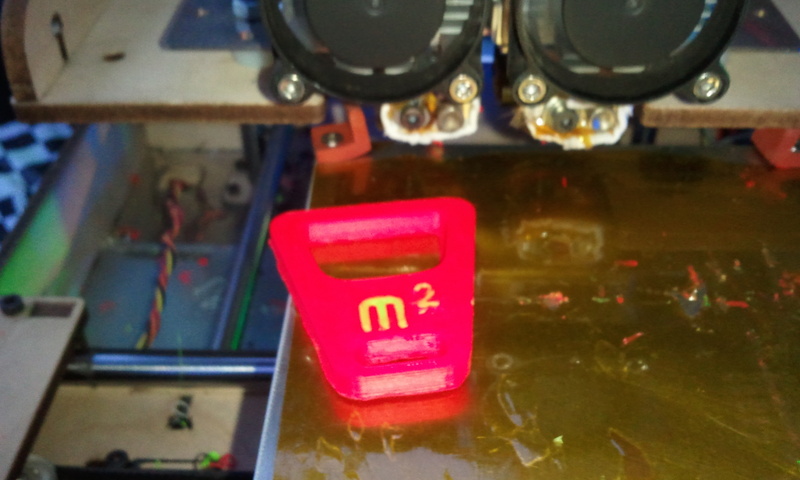 They take my design – the second 2-color part to be user-submitted to thingiverse – and print the hell out of it. While volunteering in the soldering area, I ask a group of people if they need help with their Brush Bots. There’s a tricky little step where you’re supposed to tape the the battery leads to the motor. A girl in the group, maybe 11 years old, tells me that they don’t need help; she has found a much better way to do it. And it is better: forehead-smack better. I have her teach another volunteer the technique, and when I come back 2 hours later everyone is doing it her way. As you can imagine, I thoroughly enjoyed myself. I will definitely be doing this again. This entry was posted on Sunday, September 18th, 2011 at 7:56 pm	and is filed under Uncategorized. You can follow any responses to this entry through the RSS 2.0 feed. You can leave a response, or trackback from your own site. Awesome. I guess that’s how the best stuff gets done. great to read your writeup! Sounds like a successful and inspiring trip. Great to meet you at the Faire! Enjoying your PID posts now. Hope to meet you again in SF or elsewhere!